You know I have a love for buttons. I've spent more than a little time on pinterest looking at beautiful things that people have made out of them and have seen an amazing array of cuffs. I decided to give it a try. The large main buttons were made into a bracelet before but the string broke - these are rather heavy and I shouldn't have just threaded anything through them. I placed them first and added the rest a couple at a time. The larger red ones are the extras from a Halston III blouse, his line for J C Penney in the early 80s. I was surprised to find them in one of the jars that I got for Christmas. My original plan was to only use red but the fabric, silk from a vintage tie, is very colorful so I decided to add the white and blue. It fastens with two loops made from a pony tail holder. They are perfect for use as a fastener since the skinny elastics don't work for my thick hair at all. I wore it today and it's really comfortable. Tomorrow I'll be going through my buttons again to start on another one (or more!) in some other colors. This first one isn't great since I didn't really know what I was doing, but it has really sparked my creativity. 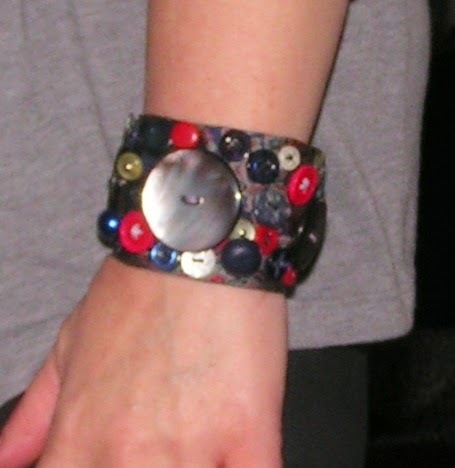 I should really get to work on some new dresses to go with my bracelets! I have been vexed lately wondering what to use for loops with huge buttons and you have provided me with the perfect solution. Thank you! I can set my sewing machine to sew buttons automatically, but it is terribly upsetting and all wrong, so I give up and do it by hand. This is a magnificent cuff.